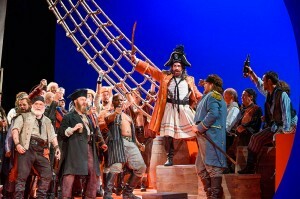 Tuesday’s live broadcast from English National Opera of Gilbert and Sullivan’s Pirates of Penzance has just blown a big hole in the opera streaming business. Pirates, in Mike Leigh’s production, took £600,000 at the UK box office at a single screening, reaching an audience of over 40,000 people. The previous UK best was the Metropolitan Opera’s broadcast of Franz Lehár’s The Merry Widow, which grossed £504,000 in total, including repeat screenings. That’s impressive. Wonder if the Arts Council gets the point? Doubt it: their website crashed today, presumably for want of visitors. I counted 9 people, meanwhile, at our local showing of the ROH “Mahagonny”. Mahagonny? That’s no surprise. Not everyone’s cup of tea, and the cost of the ticket too – it’s expensive, and more so in the north of England where wages are much lower than London. You can get in to Opera North for £15 and see some of the best opera and some fine productions, and it’s on stage not on a screen. £19 was okay until they put it up to £26 this past year, and London prices. Now there are fewer people going up here and the Met is not getting any more money as a result. Tickets are too costly.